Currently residing on the cusp of design fame, this classically-trained designer is capturing attention for past projects as well as current accolades, including the 2017 House Beautiful “Kitchen of the Year” which was a major feature of the San Francisco Decorator Showcase. Focused to the extent of being devoid of interests other than his work, de la Cruz operates with an obsessiveness that applies in equal measure to his design aesthetic, business management and career path, and is destined to claim his rank as one of the California’s design luminaries in-the-making. With quiet determination and a steely resolve, he continues to accumulate clout and kudos from clients and colleagues as he journeys to the pinnacle of professional recognition. 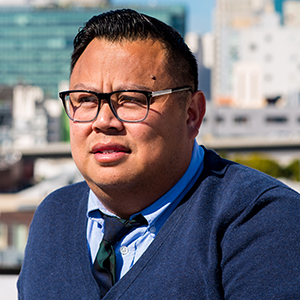 I was born and raised in San Francisco by Filipino parents. I studied biology at U.C. Santa Cruz because I thought I wanted to be a marine biologist. When I took my first advanced chemistry class, with its complex equations, I said to myself, “I’m an artist, not a scientist!” Which makes sense. As a child, I would always doodle and draw. Art was always a huge part of my life. In class, I would always be the artist who did the bulletin boards outside the classrooms. Ultimately, I learned my craft graduating from AAU with a BFA in Interior Architecture Design. My first experience in interior design was working for Joel Hendler as a receptionist. I moved quickly into a variety of roles—librarian, assistant and finally Junior Designer. The seniors did the serious architectural work. I got to do the frosting—and I loved it. I progressed to a Senior Designer role with Steven Volpe, an incredible mentor, who taught me the design basics and a keen eye for detail—how to order curtains; how to design a lamp shade or a pillow; and all of those little intricate details in traditional interior design that you don’t get in most of the younger people coming out of design school today. And he taught me how the industry works—for example, working at the residential high-end with very private clients who are protective of their privacy. When I went to work for Pamela Babey at BAMO, it was a 180-degree turn in direction. Steven’s point of view is very honed and concise. At BAMO, because of its hospitality focus, I learned how to compromise—in a good way. When you’re working on a hospitality interior, you don’t have $10,000 for a sofa. You have $1,500. I learned flexibility at BAMO—in design and in dealing with clients. Instead of “My way, or the highway”, it was “Let’s see what we can do with your budget”. I was introduced to Ken Fulk on Facebook. He was looking for someone to work on a hospitality project, which turned out to be The Battery. I worked on that assignment from start to finish—all the interior architecture, the finishes, the furniture. It was an illuminating and exhilarating experience because they did things differently and quickly. There was no CAD. No drafting. Everything was done through images and fabrics. They would be clipped to a board and then shown to the clients. They would promise to deliver full houses in three to five weeks. And it would happen because Ken had an amazing group of people who were intensely creative and committed. I don’t want to become a huge design enterprise. I want to have high-quality projects and a great team, and develop a portfolio that I can be proud of. Right now, I’m busy, so my first priority is to make sure that I’m doing right by the clients I’ve got before I worry about tackling anything else. When you hire Jon de la Cruz, you get me. You don’t get an assistant. I work on every single project. And I still like to do the actual work. I want to be the one who designs the table or the counter. That’s why I fear getting bigger. When someone walks into a room I’ve designed, I want them to feel that the design has been well thought out. For example, when you walk through the kitchen at the Decorator Showcase, the function should dictate the design. If it doesn’t, it won’t be beautiful. I stressed about everything on that job — about the placement of the oven, the range and the sink, and making sure that it all functions well for a house with 10 bedrooms. I could stand in that kitchen and not find a single thing that I would do differently. My house is not my showroom. It’s a big white box with a stack of laundry — folded and not put away. There’s not a lot there—a couple of pieces of beautiful art, and every now and then I add a special piece of furniture. I have a comfortable sofa and a great, comfortable mattress. When I go home, I like to turn it off and not think about work. That’s my luxury right there. I’m currently concentrating on new residential construction and restaurants. I like designing restaurants. Not only do you get to work with food people, whom I like, but it’s a faster-paced environment where the work can be more “out there” and leave a more decorative mark. You also get to see the reactions from a wider audience, and that’s particularly gratifying. Leo’s Oyster Bar was one of my first projects when I went out on my own. That was with Anna Weinberg, with whom I did Cavalier and Marlowe while at KFI. I’ve worked on the small Turner’s Kitchen in the Mission and the huge Carbone restaurant at the Aria in Las Vegas. Right now, I have a number of restaurants on the books—Che Fico, an Italian restaurant on Divisadero and an adjoining pie shop called Theorita. I’m also working on a restaurant in Palo Alto called Protege, and Merriman’s on Oahu. I had a Volpe assignment for a client who had a very traditional suburban house. It was horrible—completely overdone—the quintessential mansion that had been over-designed and over-decorated throughout the years and then sold for a lot of money to a client who didn’t think it needed any change —just more furniture. When we took that project over it was a lesson in how to develop a relationship with your client, and a lesson in design—how do you glean a diamond from an ugly rock? Joel Hendler was a great mentor because he taught me that I could be an interior designer and that this is a viable business. I’m not just being an artist — I’m being someone who can actually make a paid living. Stephen Volpe taught me about quality. Sometimes working for him would make me want to pull my hair out. His response to everything I’d show him would be, “No, no, no. None of that works.” And then he would come back and say, “Well, this is what works.” You’d look at it and you wouldn’t know why, but you would understand once you touched the fabric or saw the color. There’s that indefinable, intangible factor that makes it perfect for what it has to accomplish. Pamela Babey taught me how to break all of Stephen’s rules! I visited Europe when I was 23, and seeing Paris—all of the old beautiful buildings and architecture—was one of those moments. Just that sense of style, the panache, looking at all the windows and all the beautiful things in them. That’s when I realized, “We don’t have to just do it. We can do it with style and beauty.” Like walking into Pain Poilane, a bakery in Paris, and watching the way they wrapped a beautiful pastry and handed it to you almost as if it were an heirloom gift. Rome was also another life-changing experience. It’s a different point of view. It’s the way the Italians think—a combination of “bella figura” and La Dolce Vita. I visited Axel Vervoordt, an antiquarian and designer in Belgium. He does stunning design and collects beautiful antiques. That heightened my point of view about interior design and antiques. It taught me about the integrity of materials and antiques and how to just let it be. In his gallery, he had installed a huge Anish Kapoor dome, 8 meters in diameter and painted in this most beautiful pigment of red. You walk under the dome, and it’s almost as if you’re swallowed into time and space, and forget where you are.